The ancient port on Pharos island may have been one of the largest and oldest ports of the Mediterranean area according to the detailed description provided by Gaston Jondet (1916), followed by Raymond Weill (1916) and Savile (1940). This is confirmed by the modern Google Earth picture of 20/1/2015 that clearly shows the underwater structures. 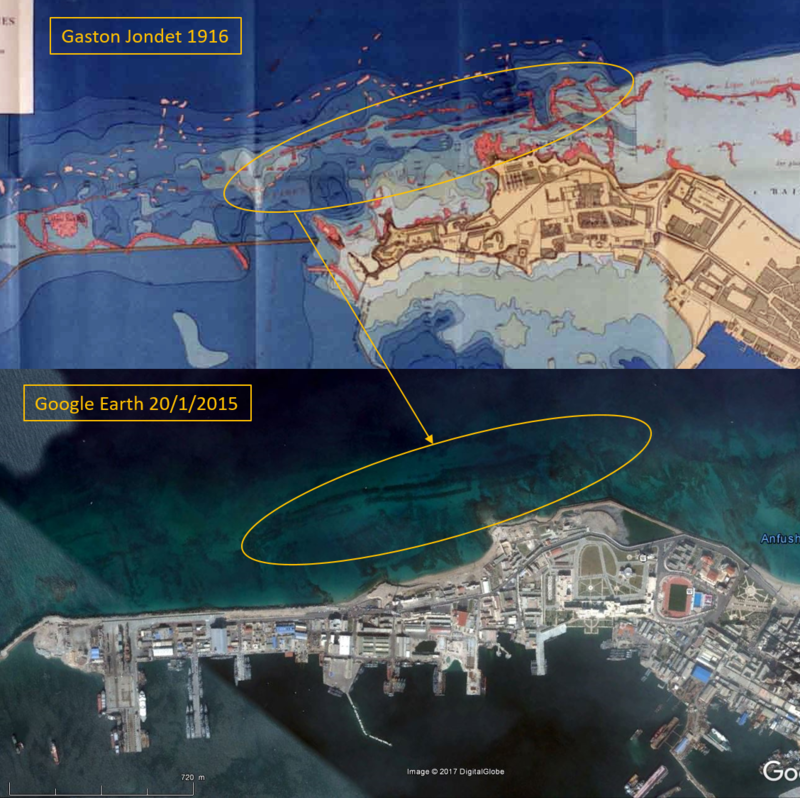 Jondet’s map compared to Google Earth’s picture (20/1/2015) showing the main north breakwater of the ancient Pharos port. Jondet’s cross-section of the main north breakwater. According to Jondet, the main north breakwater with a total length of more than 2300 m consisted of two rubble mounds on a water depth of 4 to 5 m with 40 to 60 m in-between. The total width of the main north breakwater was therefore 60 to 80 m. Both rubble mounds were made of large rocks (2 to 3 m ‘soft limestone’ from local quarries). The area between both rubble mounds was filled with sand which was found in some places, but in other places, sand was washed away over time. The crest of the breakwater was covered with 2 to 3 m rock slabs. Jondet estimates the total harbour area to around 60 ha. The main entrance was around 200 m wide and 8 m deep on the south side of the Pharos island. It was sheltered by two short breakwaters (called here SW and SE breakwaters). Immediately east of the entrance was an island with what Jondet supposed to be the building of the port authority, with an adjacent small basin protected by two small breakwaters. The main deep-water basin was located west of the entrance and over 500 m long. More basins were located east of the entrance but most were shallow (ca 1 m) and bordered with beaches and very small port structures. A deep-water basin was found on the NE side of the harbour and called “port de commerce” by Jondet. This basin was around 60 x 150 m with its own separate entrance towards north. Jondet’s description of the ancient Pharos port. Additional offshore breakwaters were found later on by Jondet’s team. These structures are located around 200 m north of the main north breakwater mentioned above. The water depth is around 10 m and their crest is located at 6.5 to 8.5 m below todays sea water level. They created an outside basin (Jondet’s “bassin extérieur”) and Jondet believed that ships could therefore moor on both sides on the main north breakwater (which would therefore not really be a breakwater any more, but a long jetty). This offshore breakwater was obviously of great interest for sheltering the entrance of the northern basin. Jondet paid particular attention to the Abou Bakar reef on the west side and to the east reef, considering that the structures found there were part of a heavy defence system of the port. He also mentioned that access from the south was through todays Dikheila area after passing between the reefs in that area. Now there is an isle in the sea-surge off the mouth of the Nile, that men call Pharos, a day’s run for a hollow ship with a strong wind astern. There’s a good anchorage there, a harbour from which men launch their trim ships into the waves, when they have drawn fresh black water. However, no other ancient author did so and this may be a sign that the port disappeared soon after Homer’s time (i.e. between the 8th and the 5th centuries BC), possibly due to sudden tectonic activity. However, Homer may have been talking about an archaic port long before his time and even before the Trojan war (now dated around 1200 BC). Gaston Jondet tried to date the port but he had no archaeological clues to do so. He came up with a theory that Rameses II (reign 1279 to 1213 BC) may have ordered its construction after his victory over the Sea Peoples (1277 BC). This theory would be valid also for Merneptah (1208 BC battle) and Rameses III (1175 BC battle) but it is somewhat surprising that none of these kings mentions this port and that all battles have been fought inside the Nile delta and not in open sea. It may be mentioned that the Amarna Letters (around 1350 BC) do not mention this port although many other places on the Levantine coast are. However, this is of little help because the port may have been built later, or earlier and already disappeared. Raymond Weill (1916) suggested that the port was built by Minoan foreigners whose settlement would have been accepted by the pharaoh sometime between 2000 and 1500 BC. But this theory now seems somewhat unlikely if we consider the remains of the 85 Minoan ports identified so far, which are all quite modest, except Phalasarna, perhaps, (see xls table). He also points at the Phoenician Tyrians who lived in very similar conditions and were great builders in the same period. This theory makes more sense. Archaeological evidence: none published so far (? ), except the fact that the breakwater cross-section shown in fig. 2 above could be seen as an ancestor of the typical Phoenician breakwater structure. Geochemical evidence. Recent investigations on lead (Pb) pollution of sediments taken from the Alexandria Bay (Magnus Portus) show a possible anthropogenic imprint as early as 2300-2650 (±200) BC and, to a lesser extent, 3500-3800 (±170) BC (Véron et al., 2013). Lead pollution is strongly correlated with human activity as it was used for pipes carrying drinking water and for many other things. Geoarchaeological evidence. According to Homer (8th c. BC) the port was located on an island and this is confirmed by modern geo-archaeological investigations that show that a tombolo developed during the 3rd and 2nd millennia BC between the island and the continent (Goiran et al., 2014). This was due to wave action from NW inducing a littoral drift (sand transport) from west to east. This sand deposited in the lee of the island where wave action was limited. Hence, the insular character of Pharos island gradually diminished and a ford was probably available for crossing from the mainland to the island in the 2nd millennium BC. These investigations show that this area was inhabited very early, and this is no wonder for such a nice shelter for shipping, but it would be difficult to believe this very large port of Pharos being built before 2000 BC. Hence, our construction date estimate cannot be more accurate than “sometime between 2000 and 1000 BC”, possibly by Tyrians. After that, the story is well-known: Alexander founded Alexandria on the mainland at a place called Rhakotis in 331 BC and his successors, Ptolemy I and/or II, built the Heptastadion and the eastern port, around 300 BC. Land reclamation project on Pharos island. GOIRAN, J-P., CARBONEL, P., CAVERO, J., MORHANGE, C., EMPEREUR, J-Y., (2014), “Géoarchéologie du port maritime d’Alexandrie, Égypte“, Géochronique, n°130, 2014, (pp 26-29). JONDET, G., (1916) “Les ports submergés de l’ancienne île de Pharos“, Mémoires présentés à l’institut égyptien, Tome IX, Le Caire, (121 p), with detailed pictures of his four marvellous “Planches”. SAVILE, L.H., (1940), Presidential address of Sir Leopold Halliday Savile, K.C.B. on 6/11/1940, Journal of the institution of Civil Engineers 15, No 1, November 1940, (pp 1-26). VERON, A., FLAUX, C., MARRINER, N., POIRIER, A., RIGAUD, S., MORHANGE, C., EMPEREUR, J-Y., (2013) “A 6000-year geochemical record of human activities from Alexandria (Egypt)“, Elsevier, Quaternary Science Reviews, 81, 2013, (pp 138-147). WEILL, R., (1916) “Les ports antéhelléniques de la côte d’Alexandrie et l’Empire crétois’’, Bulletin de l’Institut Français d’Archéologie Orientale, Tome XVI.